Apropos the news item “Pressure on PHE to provide clean water” (ST Dec.3, 2018) my take is that PHE will never be able to provide safe and clean drinking water to Shillong city as long as the PHE lake at Umiam (Mawphlang) is highly turbid and also is polluted by the upstream inflow all the year round. How much can the Treatment Plant at Mawphlang make the water clear, safe and clean? Even the highly turbid water at the Treatment Plant is made clearer and somewhat clean by adding Alum which makes the water oily and somewhat sticky. The treatment Plant at Mawphlang cannot remove all the turbidity, the germs, bacteria and whatever pollutants present in water. Water made available by PHE at the homes can only be boiled by most people before drinking. But boiling cannot remove all bacteria and pollutant compounds present in that water. It will be of great help if the catchment areas of Umiam river on which the PHE Mawphlang Dam is constructed is properly conserved, preserved and proper afforestation is done. Again building of check dams in the upper courses of the river will help check heavy siltation. Some things require immediate attention. Sand mining, stone quarrying, washing of clothes, washing of cars and other forms of polluting activities in the up-stream of the river have to be stopped and this requires stringent action against polluters. 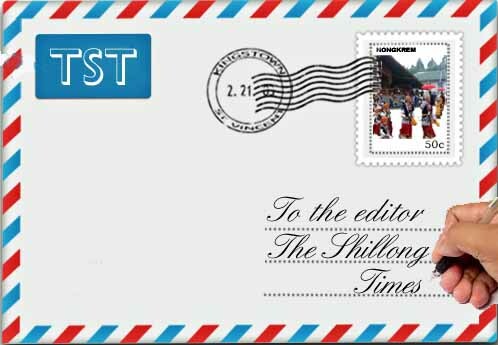 This, in the long run, will help ensure clear, clean and safe PHE drinking water for Shillong city. Otherwise, we are asking for the impossible. Treatment of water at the Treatment Plant is of little help. If the public and the Government join hands to ensure that the above measures are put in place they can contain much of the pollution, but who will bell the cat? Apropos the news item “Delhi fixes weight of school bags for students” (ST Dec 3, 2018), it is high time that our state government also takes similar initiatives in the interest of the students, since heavy school bags significantly affect a child’s overall health. Many a times, we see young school children carrying their school bags which are quite heavy when compared to their age. In Tura, most of the school kids go to school on their own; they even cross the streets themselves despite the heavy traffic of Tura. What’s more dangerous is that children have to navigate the busy streets and walk alongside the moving vehicles. And it also happens that pedestrians have to signal the incoming cars in order to cross the street. Many associations and organisations claiming to work for the welfare of the student community are there, but most of them forget about the interest of school-going kids. And what about the school education officers? Aren’t they supposed to be looking after the needs and to address the hardships of these children? I just hope that the school children in Meghalaya too are spared from carrying their heavy bags. It is important for parents to realize that as their kids grow up they need to treat them as equal friends and not as commanding parents. In our culture, parents often consider their children as their extended ego or mirror shadow and dump all their personal aspirations, frustrations and depression on them. The level of expectations being too high they start suffering from depression with advancing age as their kids grow up and start having their own space in life and get engaged in their own circle. Parents feel neglected after making their kid’s career, attention and prosperous future as their only goal in life. If parents keep pushing their kids beyond the final threshold level it only creates a huge communication gap and the distance between them increases over time. This pushes kids to move out of their close family circle and shift to their own personal orbit where parents have no roles to play anymore. Every individual on this planet needs a personal space and minimal privacy and parents need to remember and respect that. A healthy and friendly relationship between parents and their children always keeps a communication path open and enables both sides to reduce their difference through open and fair discussion and dialogue.